This one I chased after, even though it doesn’t fit into my personal collection profile of All Stars and Hall of Famers. 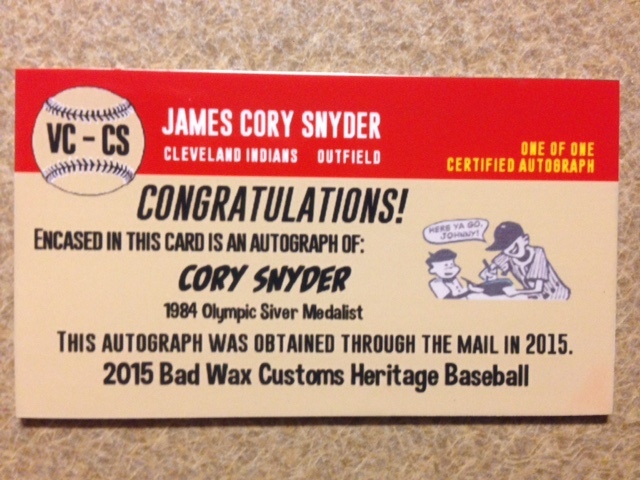 It doesn’t even matter though because it’s Cory Freaking Snyder. Anyone from the 80s knows why this autograph is awesome! 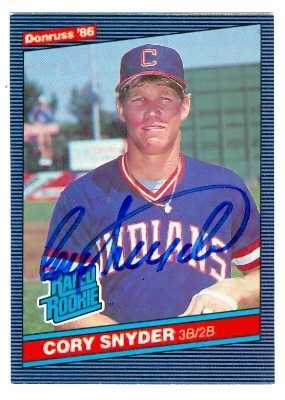 Snyder is from the heyday of my childhood collecting. I still have north of 50 of his cards, and I will probably not get rid of them. He has long since left the sport and the value of those cards will remain at a constant 50 cents a piece (a full dollar less than I paid for them), but I can’t let them go. 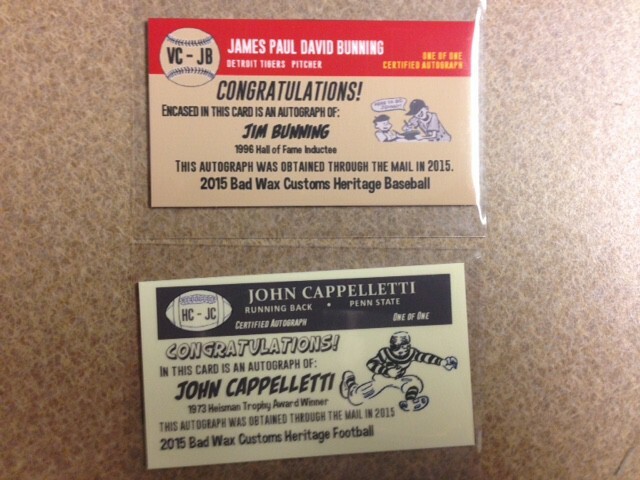 He was my first prospecting card. After Mark McGwire’s cards went through the roof, I started gobbling up those beautiful orange and blue cards, Shane Mack, John Marzano, and Odibie McDowell. I couldn’t get enough of them, they were going to be my college education. In the end though, they all became good players, but not super stars and certainly not Hall of Fame members. 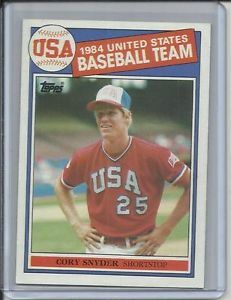 Cory Snyder is a reminder to me, never fall for prospecting, ever! One out of a thousand prospects turns into a star, an even smaller percentage become superstars and a minuscule amount become Hall of Famers. Just ask all those Dice-K collectors. Still, this autograph will be among my favorite in the collection. It will go right up there with Kevin Elster’s when I get that one back. 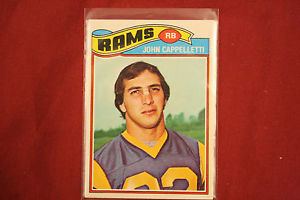 Before there was Reggie Bush / Darren McFaddon / Adrian Peterson, there was John Cappelletti. I know you’re all like who? Here is a list of awards won during his senior year (1973) at Penn State, Heisman, Maxwell, Walter Camp, Chic Harley, UPI Player of the Year, and first team All American. He was the 11th overall pick of the 1974 NFL Draft. 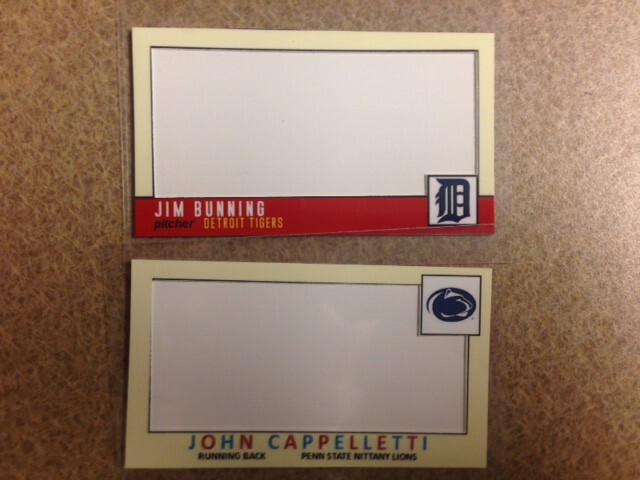 Joe Paterno once said that of all the players he has ever coached, Cappelletti was his favorite. He was one of the best college players of all time and in 1993 he was inducted into the College football Hall of Fame. He had a decent NFL career, nothing spectacular. 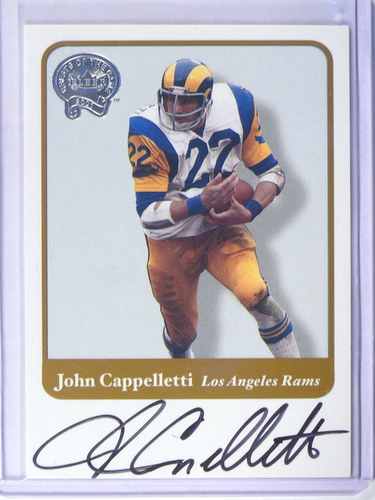 He played for the Rams and the Chargers, never amassing more than 700 yards in any one season. His NFL career is not why I went after his autograph, it was his college play. 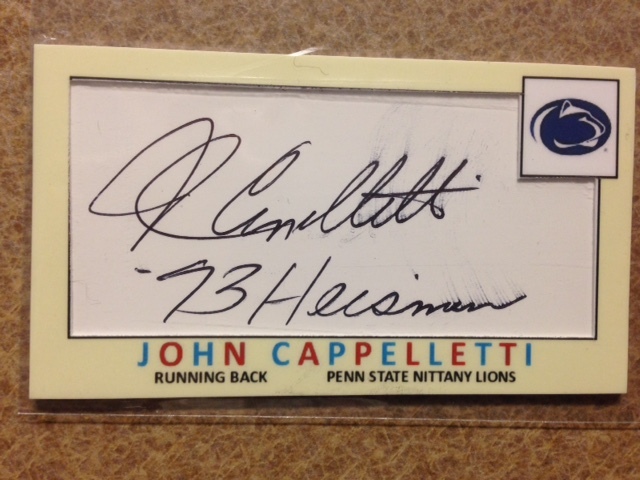 Growing up in NJ, you hear of all the great PSU players and I always knew about Cappelletti as one of the best running backs in PSU history and that’s saying a lot since for years it was known as Running Back U. Both of these autographs are special to me since they bring me back to my childhood. I’m so happy to have gotten a chance to get a through the mail success with either of these guys, and yes if they would have asked for a donation to their charity, I would have done it in a heartbeat! In fact if either is reading this now, email me using the envelop in the top left corner of my site and tell me your favorite charity to donate to. These are my next two through the mail attempts. I decided to do one of each sport. Jim Bunning – He’s a great request from any angle you look at it. He’s a Hall of Famer, a twelve year House of Representitives member, nine time All Star, three time season strikeout champ, threw a perfect game and a no hitter. Plus he’s a prolific through the mail signer. 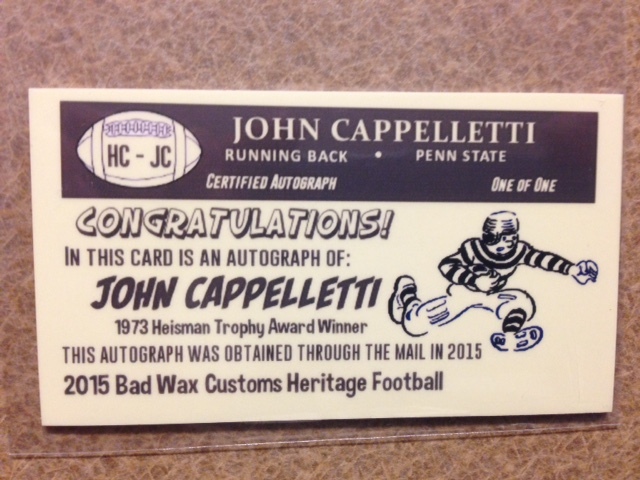 John Cappelletti – Won the Heisman Trophy in 1973, was a former 1st round pick, was inducted into the college football Hall of Fame, plus Joe Paterno called him “the best football player I ever coached”. 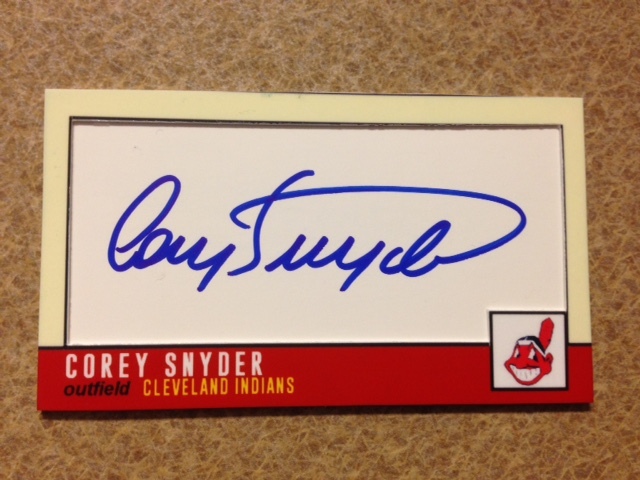 Another prolific TTM signer. These would be great additions to my collections so I am very excited to send these out.